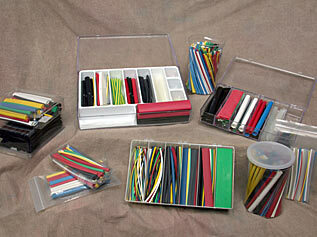 Brand Dielectrics can make up kits to your specifications in single tubs, multiple slot boxes or zipper bags. Let us know what your needs are and we will help you with the layout, sizing and types of tubing that will work for your application. Kits can include our tubing, your tubing or a combination of both. Tubing can be marked with the corresponding size and type or even show your name and logo. The boxes, bags or tubs can be labeled with your information, contents, and/or part numbers. Our kits are great for Salesperson samples inside the office or out on the road. Please contact a salesperson for details.